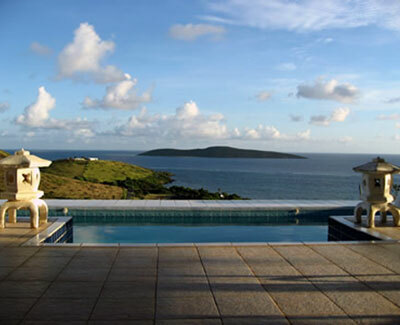 Amonoka means "peaceful home" in Sanskrit -- and peace is what you will find at this spacious, classic villa facing the sea and Buck Island on a panoramic ridge above Teague Bay. Just beyond The Reef golf course on St. Croix's east end, you'll arrive at a gated entry, framed with bougainvillea, that opens to reveal the private road leading up to this beautiful home. Upon entering through a door accented by a stained glass panel, you'll be enchanted by the breathtaking view that unfolds before you -- and by the abundant space, both indoors and out, where everyone can spread out and enjoy the tropical scenery. Pickled cypress beamed ceilings provide classic Caribbean atmosphere along with the breezy floor plan that flows from room to room. Indoors, your great room has a dining area to the right and a sitting area to the left, with a separate media room tucked alongside. It's outfitted with comfy tropically-styled recliners, a large-screen satellite television, and a highspeed internet connection, even extra sleeping space if you need it. Two bedrooms are to the far left, each with sliding glass doors facing the Caribbean. One, in cheerful sunshine yellow, has twin beds which can be made up into a comfortable king bed; the second, a serene sea blue, has a king-sized bed as well as a separate deck facing the valley's golf course below. Each bedroom has its own private bathroom with shower and welcome amenities, such as hair dryers. In the master wing on the east side of the house, a large and airy bedroom has the ultimate luxury: double "his and hers" bathrooms, one with a shower and the other with a tub, separated by a large closet. There's even an outdoor shower with a view of Buck Island just off your own balcony. The lower level has an expansive private apartment with its own entrance and a covered patio with the same magnificent view of Buck Island and beyond. It can sleep up to 4, with twin beds which can be made up into a luxurious king-size bed, plus a queen-size sleeper sofa. A compact but full kitchen completes the picture. A most desirable feature of Amonoka is its generous outdoor spaces -- the tiled gallery and decks fan out around a large, inviting pool to face the island's most desirable views. A large teak L-shaped sofa and teak dining table truly make outdoor living easy, stylish and comfortable. Dining in your bathing suit, relaxing with the reading you've meant to do, or even swimming a few laps, you won't miss a moment of the delightful scenery.